posted by Howard B. Owens in politics, Democrats, Kirtsen Gillibrand. Earlier this month, a group of regional Democratic leaders traveled to Buffalo to meet with newly minted U.S. 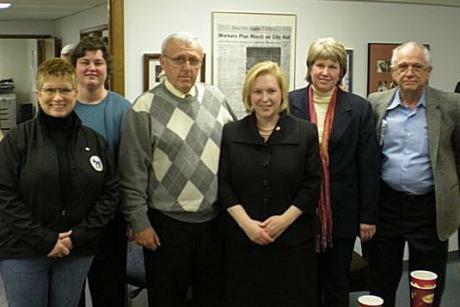 Senator Kirsten Gillibrand and Congressman Steven Israel. Among the issues raised by GLOW Democrats was the dairy farm crisis, which we covered previously. The Democrats discussed with Israel possible candidates to run against Congressman Chris Lee in 2010. Members of the GLOW Democratic Coalition traveled to Buffalo on Saturday, April 4, to meet with New York U.S. Senator Kirsten Gillibrand and Congressman Steven Israel (NY-2) and discuss the needs of Genesee, Livingston, Orleans, and Wyoming Counties. “Now that our Democratic committees are working together across our region, we’re getting opportunities to speak up and be heard. This was a great morning for our coalition,” said Lorie Longhany of LeRoy, Chair of the Genesee County Democratic Committee. One of the things that came up in both meetings was the new GLOWDemocrats.com website. Senator Gillibrand’s staff was especially complimentary of the site, which tracks and analyzes developments that affect the GLOW region.